TO NGOC VAN | Geringer Art, Ltd.
TO NGOC VAN (Vietnamese, 1906-1954). The painter, writer and revolutionary To Ngoc Van was born in Hanoi in 1906. 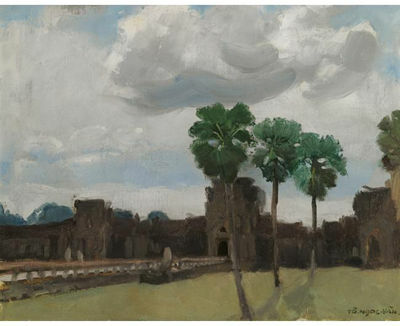 He was one of the first graduates of the Ecole des Beaux Arts de Indochine in 1931. Over time he was increasingly influenced by the work of Paul Gauguin, and his art became characterized by delicacy of form and brilliant use of color. During the 1950’s he oversaw the establishment of the new state school for the arts in Viet-Minh territory. To Ngoc Van taught both drawing and Marxist-Leninist principles. The school and its students produced paintings, posters, stamps and other visual emblems. In his writings To Ngoc Van often discussed the issues raised by the role of an artist in a political context. To Ngoc Van died in 1954 during the Battle of Dien Bien Phu, after which the French were forced out of Viet Nam.